If you would like to capture and record the screen of an iPhone, iPad, or iPod touch, you can easily do so thanks to QuickTime, the video app that comes with every Mac. This offers a simple solution for recording the screen of an iOS device for demos, presentations, tutorials, and much more, and it’s remarkably simple to use. To get started capturing a video of an iPhone or iPad screen with QuickTime, you’ll need a USB cable, and want to be running a modern version of MacOS and Mac OS X on the Mac, and a modern version of iOS on the iPhone or iPad. Specific requirements and an alternative approach for older versions are discussed further below. But since most users already have all that is necessary on their Mac and iPhones right now, let’s jump right into recording the devices screen. That’s all there is to it, the saved iPhone screen recording will be a .mov video file. Opening the .mov file will default to launch in QuickTime, but you can edit the video in QuickTime, iMovie, Final Cut, convert it to another video format, upload it to share online, embed in a presentation, or whatever else you want to do with the screen capture. * If you want to record the audio directly from the iPhone, choose the iPhone as the ‘Microphone’ source input as well, otherwise the video capture will come from the iPhone screen but the microphone will record from the Macs built-in mic. The screen video captured on modern devices is high resolution, on new iPhones that is 1080 × 1920 resolution in vertical mode, and 1920×1080 in horizontal. For longtime Mac users, you may recall that it’s also possible to record the Mac screen with QuickTime too, a handy feature that has been available in OS X for quite some time. The introduction of the ability to record connected iOS device screens is much newer, however, and it’s sort of a hidden feature that is often overlooked. 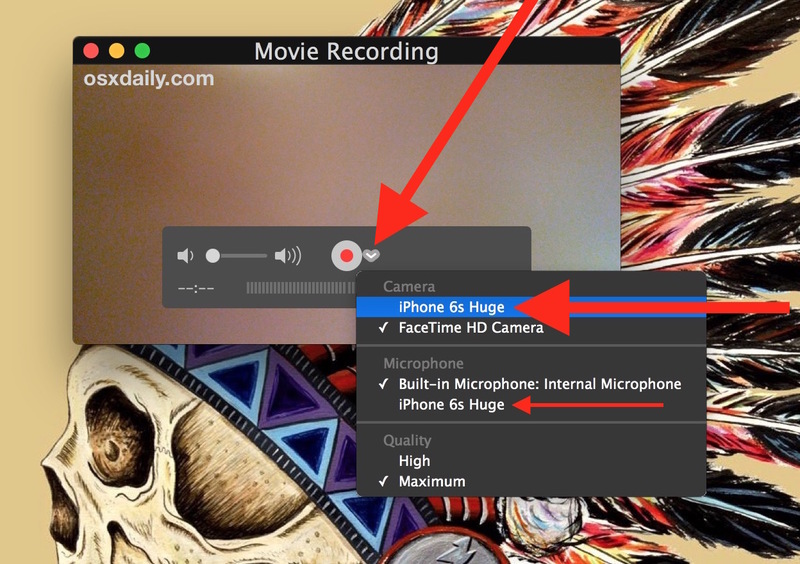 There’s even a built-in audio recording feature in QuickTime if you just need to capture some audio, even audio from the iPhone or iPad microphone. 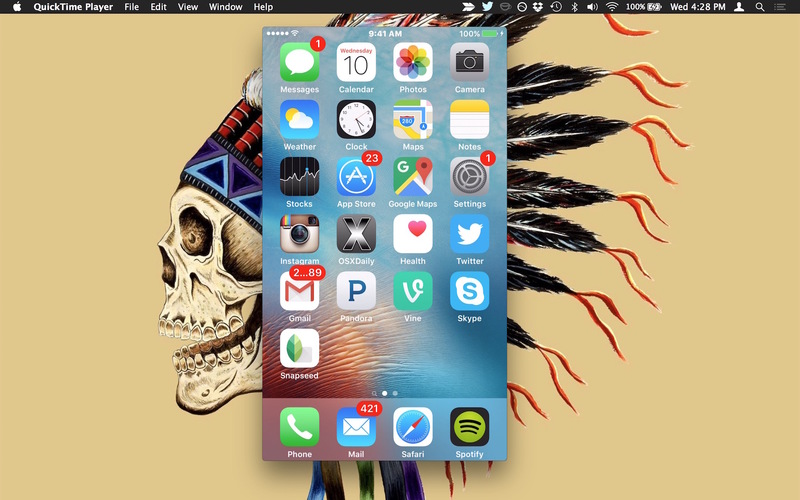 The tutorial demonstrates mirroring and recording an iPhone 6S Plus screen with iOS 9.3 on a Mac with OS X El Capitan 10.11.4, but it will work with any other iOS device or Mac as long as the basic system requirements are met. The iOS device must be running a modern version of system software at version 8 or newer, and the Mac must be running a modern version of MacOS or Mac OS X at version 10.10 or newer. If you do not meet these system requirements or are running prior versions of system software on the Mac or iOS device, older iOS devices can record their screens using Reflector, a third party app covered here, which is a viable alternative and works great for older hardware. Of course, newer devices and newer Macs have no need for third party solutions as the wonderful QuickTime Player app more than meets the need for recording high quality video of any connected iOS device screen. Another great use of this is as a presentation, without recording screen but just for displaying iPhone screen big on a Mac. Can mirror iPhone display and connect to hdmi easy. Great solution. 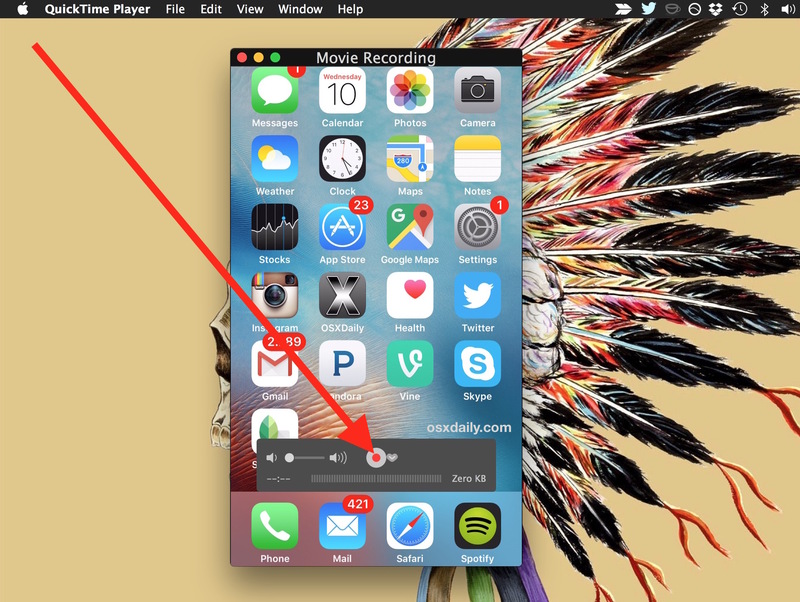 I use for recording screencasts of iPhone as well. Man, that will be really helpful for QA testers for bug reports that involve motion. I have an elaborate way of doing this on Android that involves a bunch of outboard equipment. This is WAY easier, and until now I had not satisfying way of doing it at all. Thanks. This is actually really useful for repairing iPhones. I just wish it didn’t disable the sound on the iPhone when you start it. Would it be possible to use this to record phone calls? Try it out and let us know. Do remember that recording phone calls is illegal in many jurisdictions without notifying the parties being recorded, which is why “this call may be recorded for quality assurance” is so common on call lines. OK so I tried exactly this, it works to record a phone call as long as you pick the iPhone as you play it in speakerphone and the Mac microphone, or pipe in the Iphone microphone. The problem is when you do that, you can’t hear the audio on the call, as it routes the audio output from the iPhone directly into Mac audio input, but the entire conversation and phone call is recorded anyway. Interesting. Maybe there’s a way around that little hiccup, have microphone play both, or you can record the audio call from the iPhone with speaker phone too but you can do that with a generic ‘new audio recording’ and it’s not as clean of an audio catch. Interesting stuff though, if anyone figures it out let me know. This is exactly what I need but how did you get the iphone screen on your mac? 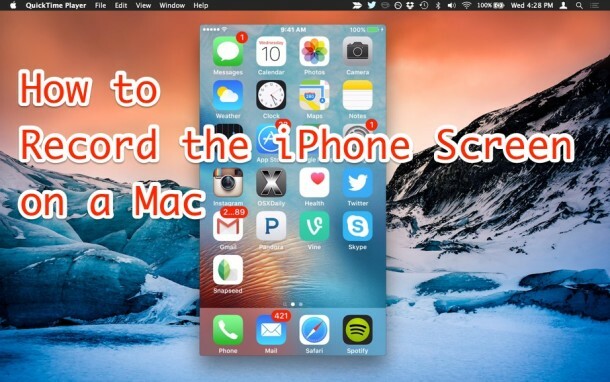 CJ, this article tells you exactly how to get the iPhone screen to appear on the Mac, and then how to record the iPhone screen on your Mac. Just follow the instructions, it works exactly as described. Enjoy, It’s a great feature! i’ve tried this but it didn’t come out my “iphone” in the camera list. it just the Facetime HD camera. do you know why? Yes, step 4 indicates you must select the iPhone, after it has been connected to the Mac, as the camera source, in order to record the iPhone screen. I’m having the same issue. My iPhone doesn’t even show up as an option when I click the little button next to the record button. My only option is my Facetime HD built in camera on my mac. As mentioned – I am having this issue also. And, as mentioned, all the tech specs are in-order. OS El Capitan (latest update), and iOS’s with the latest updates as well. Various Macs, and various iPads/iPhones – Quicktime just never sees the devices connected. It would be great if someone had a solution that did not involve linking right back to the original steps that are not working. When I first plugged in my iPad, the photos application came up. I clicked the getting started button, etc. then in the main window, there’s a checkbox for something like “open photos for this iPad”. I unchecked that and exited photos. Now I’m seeing my iPad as an option in QuickTime. Is there a way to get the iphone camera to not show the onscreen buttons? I’d love to be able to record video directly to quicktime instead of saving it on my iphone, which has limited storage. But when the camera app is on, the onscreen buttons display and get captured on the QuickTime video. Is there a way to just get a clean video with nothing else on the screen, like when I’m watching something? Or another app that uses the camera but doesn’t overlay button graphics? I can’t seem to find any way to get just the camera feed on the screen and nothing else. Hello i have got the recording to work but while i am recording i cannot hear any audio coming out of my phone :/ Is there a way to fix this problem??? Is it possible to capture the gestures (tap, swipe, zoom, etc) while recording? This doesn’t work. We’ve tried it on 2 Macs, BOTH running El Capitan, with an iPhone 6, and an iPad 3 (both with latest iOS). Everyone keeps repeating the same steps, but you guys need to understand that a large swath of us do NOT SEE ANY DEVICES. Yes. I opened “New Movie”. Yes everything is up to date. We’ve done this with iPhones, iPads, and on Macbook Pro’s and MacMini. It will not work under any circumstances. Quicktime does not recognize the device connected to the computer. It’s as if it doesn’t see it at all. No audio options, no video options. Please do not repeat the same suggestions. Enough people have expressed this issue (given the steps provided) – the issue still exists. What would be nice? An actual solution. Anyone? I just wanted to reiterate what Mike has said. Everything is updated, I am selecting “New Movie.” I have tried multiple USB cables and multiple IOS devices. I would love to use Quicktime to record a tutorial for teachers I work with, but it is not reading any of my IOS devices. I would really appreciate if anyone has any other solutions? QuickTime on new versions of MacOS contains the ability to record the iPhone or iPad screen, assuming it is connected to the computer with a USB cable, and all devices are compatible. Is the device found in iTunes? If you can’t see the iPhone / iPad in iTunes, then the cable or USB port is likely the problem. Try new movie for a new screen recording, and then selecting the pulldown menu to show what type of movie and that is where you select the device to record the screen for, it is where the iPhone will appear. The ability to record the screen requires modern versions of Mac OS and iOS system software to be installed too. Older devices and older software do not have the ability to record the iPhone screen. I was having the same problem as everyone else. Once I opened iTunes to check that my lightning cord was not the problem then Quicktime recognized my phone and I was able to record my screen! For all those having issues with not seeing the phone as an option in Quick Time – Try quitting quick time, opening iTunes FIRST, making sure the phone is recognized, keeping iTunes open, then opening Quick Time. That did it for me. Just upgraded to MacBook Pro and I have a bug. 1- Connect iphone to MacBook Pro, using USB/Thunderbolt 3 Adapter. But if left idle, the screen will freeze. Which is a problem, as I use this feature to demo apps on Conference calls and toggle between slides and my live demo on the phone. Could this be due to the Thunderbolt3/USB adapter? The new macbook pro’s no longer have USB ports. Anyone have any recommendations on how to trouble shoot? I can see the iphone in the list but the image of the iphone does not show up. When I click start recording button nothing happens. Only the stop button shows up. I have that also, but there is a yellow triangle above Zero KB with a ! in the middle. Yes it does. This works on every Mac it does not matter what model year it is, the feature is built into QuickTime which comes with every Mac. 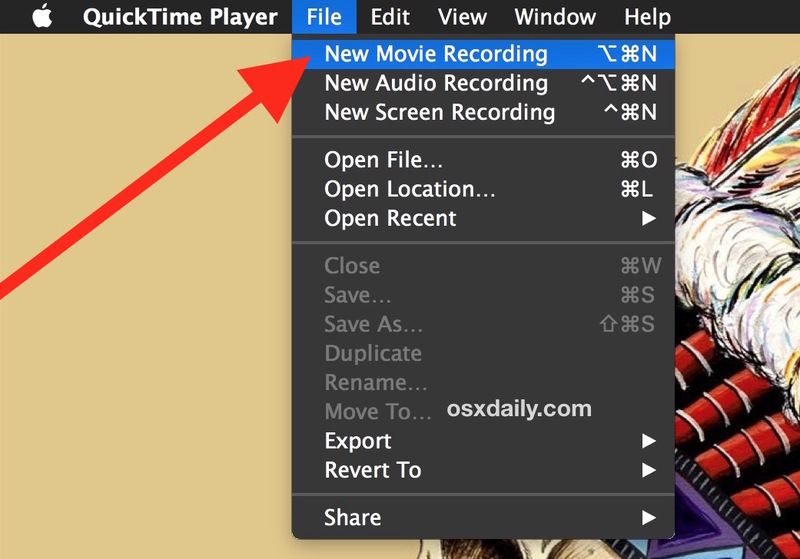 Open QuickTime and go to the File menu to record a new screen capture of your MacBook Pro. I’ve used this a lot, but now it won’t use the iPhone mic. It allows me to choose it, but there is no sound on the recording. Any reason this would not work with an iPhone 7 Plus and OSX Sierra? I could use the computer mic, but if the fan is running, the recording is noisy. 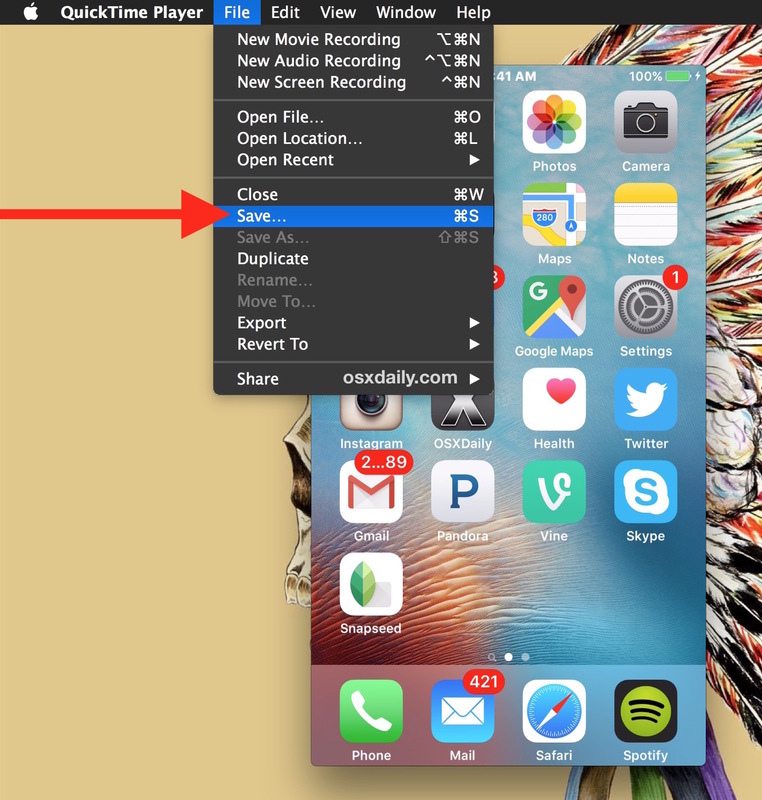 2- Open Quicktime-your phone should appear.